River Valley pitcher Chase Barber (16) delivers a pitch during the Raiders 13-8 loss to Nelsonville-York on Tuesday night in Bidwell, Ohio. BIDWELL, Ohio — The runs came early and often for the visitors during the Raiders season opener. 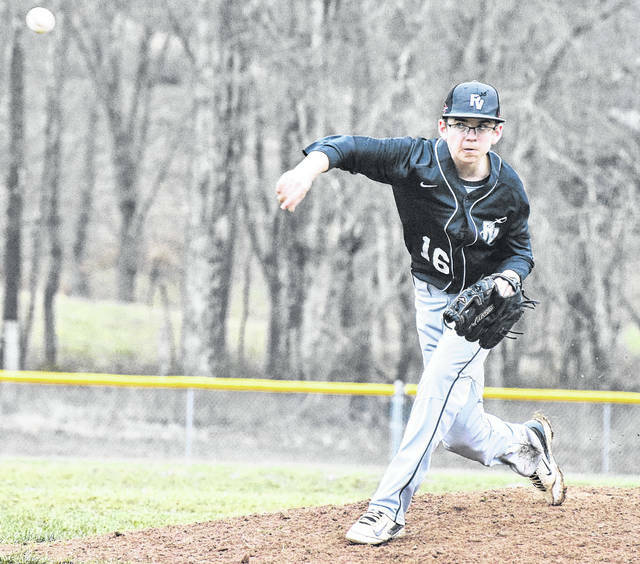 The River Valley baseball team opened its 2018 campaign on Tuesday night with a 13-8 setback against visiting Nelsonville-York in a Tri-Valley Conference Ohio Division contest in Gallia County. 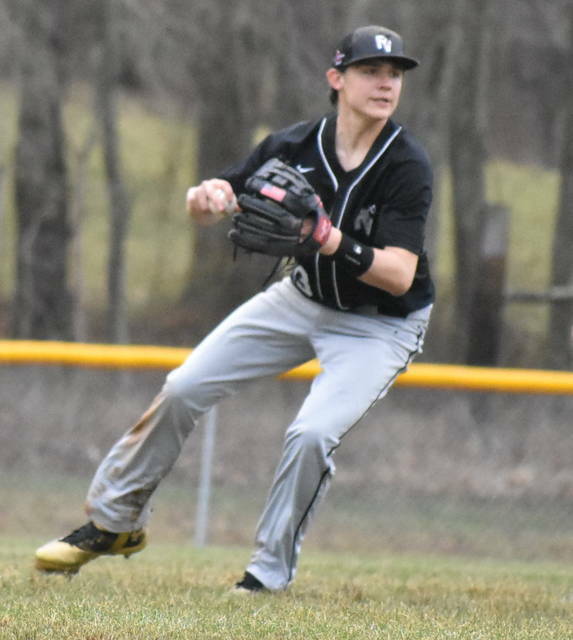 The Buckeyes (2-0, 1-0 TVC Ohio) erupted for 11 runs in the top of the second inning, as they sent 16 batters to the plate and chased RVHS starting pitcher Jack Farley from the mound after just one inning of work. The Raiders (0-1, 0-1) called on Chase Barber in relief, as the visitors touched up the tandem of pitchers for a total of three hits, four walks and had three hit batsmen in the frame. RVHS also committed four errors in the inning, as NYHS took a 11-0 advantage. The Silver and Black cut the deficit to 11-4 in the bottom of the second, as the hosts sent 10 batters to the dish and collected four runs on three hits, along with four walks and one hit by pitch in the inning. Nelsonville-York tacked on an additional run in the top of the fourth, as D.J. Hopkins drew a lead off walk and was driven home by a one-out triple off the bat of Garrett Maiden to extend the advantage to 12-4. The Brown and Orange added another run in the top of the fifth, Shakim Williams led off with a single and later scored to propel the guests to a 13-4 lead. RVHS trimmed the deficit to 13-5 in the bottom of the fifth frame, as a two-out walk by Will Edgar was followed by singles by Chase Caldwell and Alex Euton. The hosts added three additional runs in the finale, as Edgar, Caldwell, and Derek Johnson each scored runs in the inning before NYHS closed out the five run victory. Isaiah Kosler earned the victory for the Buckeyes, as he surrendered five runs on seven strikeouts. Alex Hembree provided one inning of relief and gave up three runs, surrendered two walks and recorded one strikeout. River Valley committed four errors to one by Nelsonville-York. The Raiders had nine combined hits in the contest, as K.C. Collins and Wyatt Halfhill each finished with two safeties each. Barber, Joel Horner, Caldwell and Euton rounded out the hit totals for the Silver and Black with one safety apiece. RVHS returns to action on Thursday when they travel to face the Pointers in South Point.